As I was driving to work late afternoon, I had a glimpse of a big rainbow. It was a rather big rainbow, so maybe I could see 4 degree of it filling the passenger side's window of my car. But in that short moment, I could clearly see the seven colors, sparkling with bright light. After I parked my car, I came out of the underground parking lot to find a rainbow still appearing close.It was no longer as big as I had seen, but still, it was a beautiful rainbow. What was impressive about it was that it was changing its form and brightness continuously. 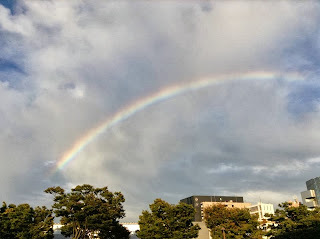 The left bottom of the rainbow in my photo is dark, but soon, it started to become brighter with dintinct seven colors. This past summer, we had lots of late afternoon showers followed by apperance of a rainbow. But today's rainbow was special. It reminded me of the power the rainbow has: it lights up one's heart wth a sense of hope.